Perfect skis for high speed short turns. The long, progressively tapered nose provides unrivalled floatation, an absolute revolution in the ski world. 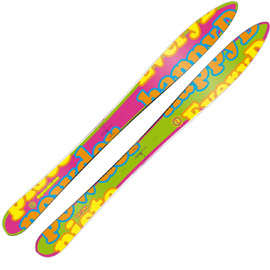 A huge surface area 0.49m2 for float with a long progressive tip, the asymmetrical shape and deep sidecut designed to turn make this a truly unique ski. Skis have asymetrical shape - you can switch skis for powder or for piste. Redefining the concept of stability, float, and speed, this powerful tool will open the door to unbelievable thrills off the beaten path.